Storytime started again this week! I’ve been anxiously awaiting its return!! It had been forever since I did a storytime! This week starts our fall session, which lasts through November. This session I am doing storytimes for 3-5 year olds. Each week we have two sessions for this age group so I will be sharing the responsibility of planning and actually doing the storytimes with one of my colleagues. I do one storytime a week and plan every other week. This has been working out great so far. We choose themes and select some books to go along with the themes, but each apply our own style to the storytime itself. Basically, it means that we each only have to prepare half of the crafts, which is a huge time saver with the overall workload. Well enough about planning…. on the books! I started this week with Eric Carle’s From Head to Toe. Since this was my first time with this group of kids, I wanted to start with something that I consider to be a guaranteed crowd pleaser. This is a great book to get the kids up and moving around and a lot of fun to read aloud. A great way to kick off this week! 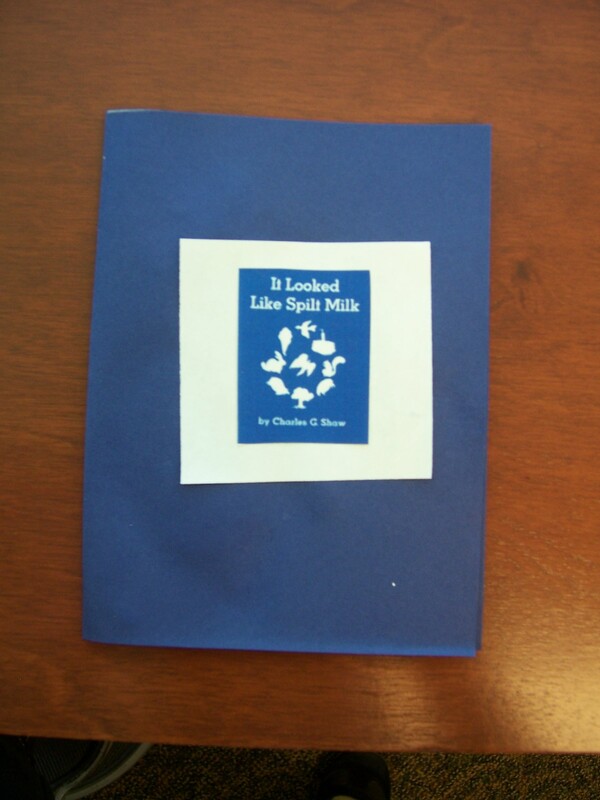 Next we read It Looked Like Spilt Milk by Charles G. Shaw. This was the inspiration for this storytime. It is a great book for storytime, as it lends itself to a lot of fun interaction and discussion. It’s also easy to make a flannel board of, which can add a whole new level to the story. Finally, we read Little Cloudby Eric Carle. I didn’t realize that I did two Eric Carle books until just now! I usually try not to repeat authors, but the kids didn’t seem to mind this time. This story is similar to It Looked Like Spilt Milk, so it reinforced its plot elements. When we read It Looked Like Spilt Milk, none of the children guessed that we were reading about clouds. I think if I had read this book first they would have guessed that right away. For the craft this week, we did a little exploring on our own with the cloud shape concept. I will be honest, I didn’t plan this week. So, I can’t take the credit for this spectacular craft. My colleague made these cute little booklets with blue paper and during the craft portion prior to the program. 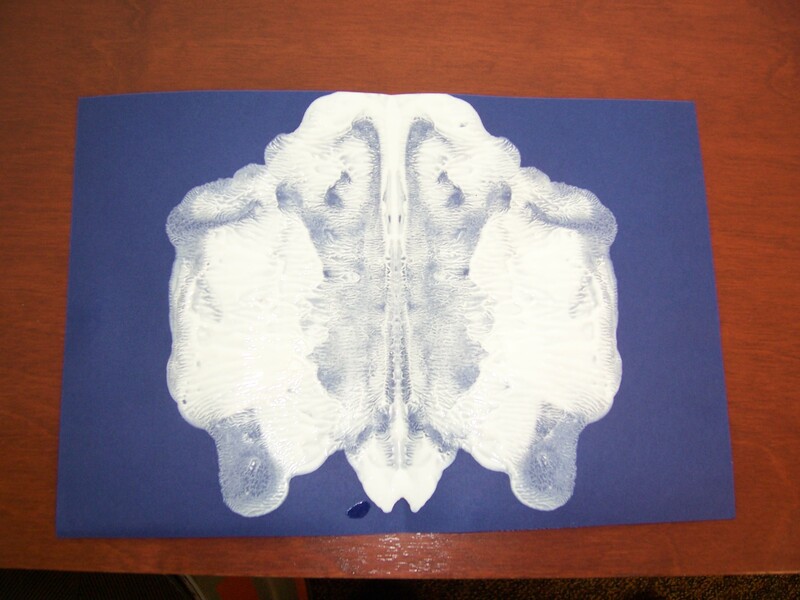 I put a little bit of white paint in the center of the booklet, had the child close it and then open it to determine what shape they think their “cloud” made. This is mine. I think it looks like a sheep… or maybe a goat. What do you think? This craft was super easy, super fun, and super quick. The only advice I would give is to make sure that you put away the paint before any of the children can get into it. They had markers to write their names, so that kept them occupied. Yay, you’re back! I’m so happy to see this! What an awesome craft and such a unique theme, too! I LOVE the stoplight necklace! We are going to have to make this very soon! Glad I found your blog!